Not unlike the birth of Google Images, Claudia Nicholson’s interest in the late Latina icon Selena Quintanilla was born of a desire to see images of Jennifer Lopez. 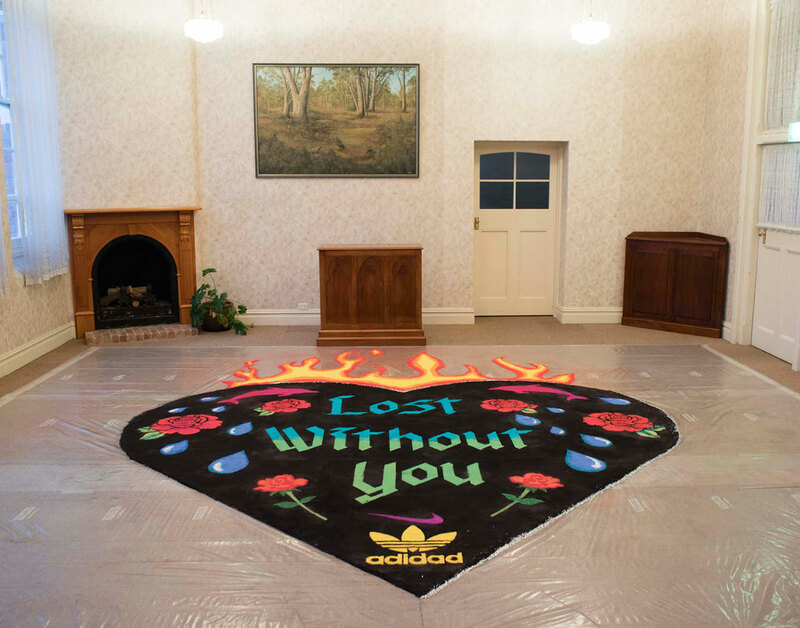 Nicholson’s fascination with the pop star, who was murdered by the president of her fan club in 1995, today takes its most significant form in her work All I Have Are Dreams Of You: an alfombra de aserrín – or coloured saw dust carpet, five metres in diameter – that functions as both a tribute, a memento mori and stage for further performances that investigate ideas of cross-cultural identities, while celebrating the liminal spaces that exist in between. At a preview for The National: New Australian Art, the multi-venue Australian art biennale that concludes this weekend at Carriageworks, Nicholson’s work proved to be utterly magnetic on first unveiling. Stunning to behold and made all the more impressive for its inherent ephemerality, the work takes its title from the song Dreaming Of You, one of Quintanilla’s first recorded in English and released posthumously. It’s also astonishingly labour intensive. First, Nicholson designs the carpet on the computer. She then dyes and dries the sawdust over a three week process using fabric dye, a rake and heaters until the dust is bone dry. She estimates using around twelve bags of sand to create a backdrop for the piece. Atop that, she stencils on the sawdust using a fine sieve. The process takes about eight days with the help of an assistant and a moveable platform that allows Nicholson to lie on top of the work and prevent, as much as possible, hard to amend missteps. Nicholson was born in Colombia and moved to Australia when she was adopted at three months old. She has since returned to Colombia three times, and says that with each successive visit she is able to greater situate a sense of her identity between those two places and their social, political and historical contexts. “I’m learning the language but it’s still a little bit out of my grasp. I don’t mind that, but I do think of Australia as my home. I’m interested in that sort of ‘in between-ness’.” Nicholson, who will turn 30-years-old next month, has been practicing as an artist for the last five years, and is in the midst of a Masters in Fine Arts and the University of New South Wales’s College of Fine Arts which will encompass her floral arrangement works, painting and ceramic works, as well as the carpets that have brought her a great deal of acclaim. She has exhibited in Canberra, Melbourne, at Sydney’s MCA, in Perth and at Tasmania’s Dark Mofo festival, having also been the recipient of the Freedman Foundation Travelling Art Scholarship in 2015 and the 4A Centre For Contemporary Asian Art Beijing studio residency. As part of the John Fries Award, for which Nicholson has also been nominated, a third iteration of All I Have Are Dreams Of You, albeit one produced on a smaller scale, will be accompanied by the documentation of a performance taking place this coming weekend. 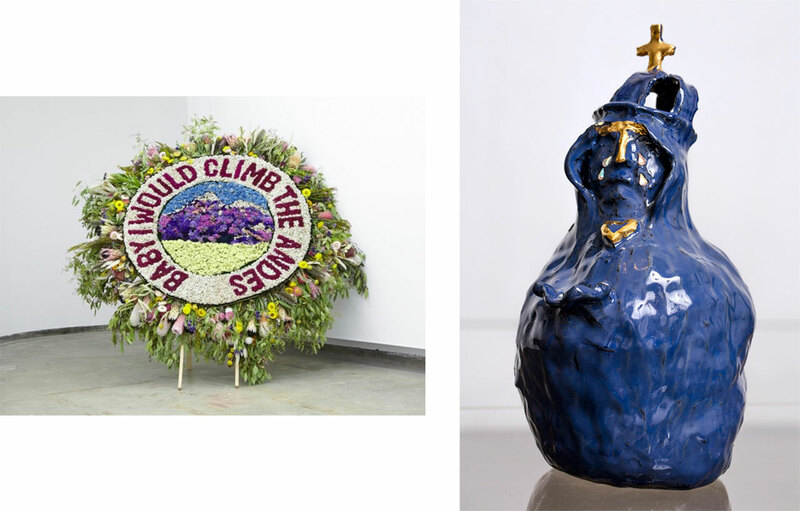 Curated by interdisciplinary artist, academic and curator, Consuelo Cavaniglia, the John Fries Award show will exhibit the work of twelve early career visual artists at Sydney’s UNSW Galleries from August 11 until September 2, 2017. 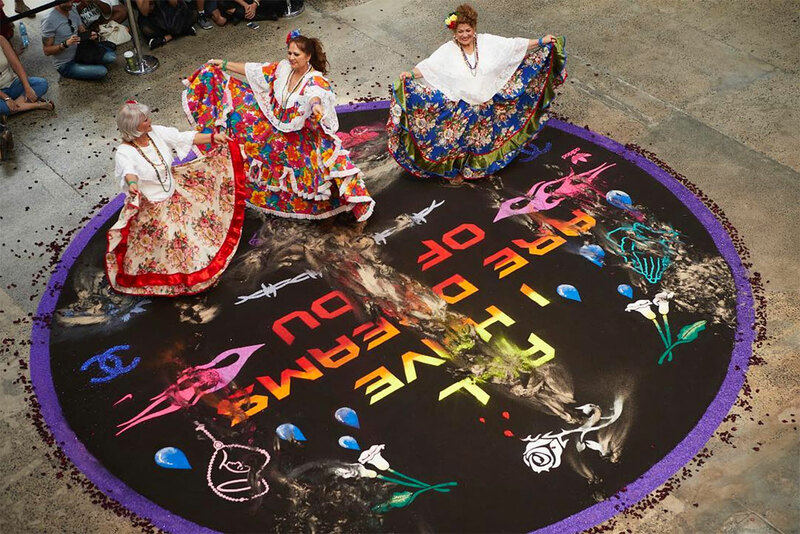 “I have six performers from the Spanish Speaking Community Choir who will be singing some of their own songs mixed in with covers of Quintanilla’s music,” Nicholson says of the performance that will disrupt the work for its last time at Carriageworks. This will be the second performance of the piece, following one staged to mark the opening weekend of The National that involved a performance of Selena’s original choreography over the carpet. It’s only fitting that the work should derive so much of its power from its representative qualities as much as its impermanence. The carpets have different purposes for different places, says Nicholson. In Mexico, they form part of Day of the Dead rituals; in Guatemala, they’re laid down during Semana Santa, or Holy Week.